Despite all of the official mounts available from GoPro for their action cameras, there just is not enough to meet every potential need for mounting or capturing possible points of view. It goes without saying that enterprising DIY'ers and entrepreneurs have come up with various items to craft for their own use or to sell to others. 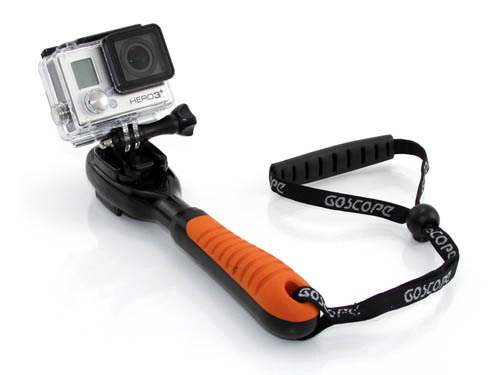 GoScope is an example - a separate company making aftermarket accessories for GoPro. They sent us a few products to check out. 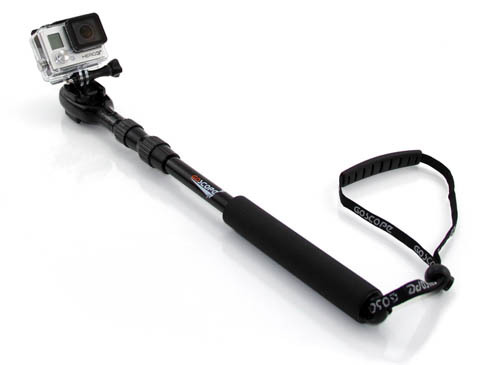 First up is the GoScope Extreme 2X Telescoping GoPro Pole. As it sounds, it's a telescoping/collapsible pole used to mount 1 or 2 GoPro cameras, allowing you to have a variety of camera angles. That could include simultaneously recording in front and behind, if you have two cameras of course, to allow lots more options when editing. Each of the two sides of the head has a molded seat for the GoPro mounting buckle (not included) to attach. The pole has two telescoping sections with a lock, allowing the pole to extend up to 37", or collapse down to 17" (claimed). The pole is made from poly-carbonate (head and section connectors/locks) and forged aluminum (pole sections), and claimed weight is 6 ounces. It can float with one camera attached, and GoScope states it is durable enough to use in saltwater, freshwater, and snow environments. The pole also has a wrist cord with a soft wrist pad, and an adjustable lock to vary how tight you want to grip the pole. The telescoping pole is a useful application. Having an overhead point of view mixes things up a bit, rather than the standard head or chest POV that can be dizzying after awhile. I've previously concocted a similar mounting option by wrapping a Joby Gorrilapod around a trekking pole, using the GoPro tripod mount. The benefit of the GoScope Extreme is that the camera is more stable and secure. Although, usually I am a fan of having gear that performs more than one duty if it means I can leave other stuff at home. 6 ounces won't break your back, though. I guess you could use this for self-defense if necessary, but remember to remove your GoPro first. There is an optional clip to attach the pole to your pack (see below). The pole is pretty solidly constructed, and it can take a beating. I am generally wary of plastic connectors and locks stripping and becoming impossible to lock over time, but these seem to be pretty bombproof. When adjusting the pole in collapse mode, it sometimes makes a god awful creaking noise. So keep that in mind if you're sneaking up on/away from wildlife. Maybe this goes away somewhat with more use and trail dust absorption. Regarding the grip - it is not as soft and cushiony as it appears in the pictures. I did not try to see if it floated. Note though that the packaging just says "it floats"... no qualifiers. But the GoScope website explicitly says it will float only one with one camera attached. Lastly, the camera mounts at a downward angle when attached (e.g. not aiming straight ahead). The downward angle will vary depending on which case you use. The waterproof case and the wider waterproof case BacPac will point the field of view to a higher zenith angle (look that up for your science lesson of the day). Given the GoPro's astoundingly large field of view, and my propensity for taking gorgeous videos of nothing but the sky due to not aiming the GoPro down far enough, this is not a problem. 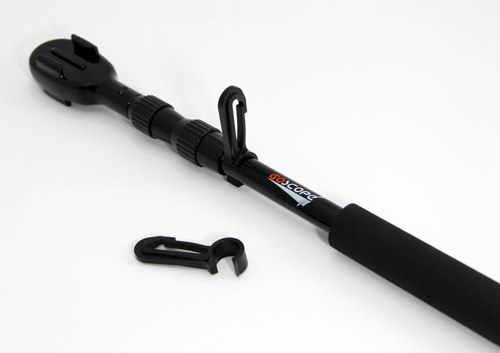 Think of the telescoping pole reviewed above in a much more compact, hand-held version. And without telescoping superpowers. The hand grip is a little beefier with a tapered shape to fit in the hand better. Though, like the pole, the grip is not as soft as it looks. The Clutch also holds two GoPro cameras - the head is basically the same as the telescoping pole head. It has the same adjustable strap with wrist pad. And it's also made out of poly-carbonate and forged aluminum. The Clutch pares down to 8", weighing in at 4 ounces (claimed). The Clutch provides the ability to control where you're filming, rather than be limited by a "fixed" point of view from a helmet/head strap or chesty mount. The Clip allows for hands-free storage of the GoScope poles or hand grip when not in use. One end has a semi-circle that snaps onto a pole section or the hand grip neck, and the other end has a gate clip to attach to a backpack, jacket, vest, or belt loop. The Clips come in a pack of 2, and are made out of high tensile polycarbonate. They are very stiff, so durability shouldn't be an issue. Pro Tip: if using on the telescoping pole, attach the clip in the narrow space between the section locks. Otherwise, the clip will slide along the pole. Disclosure: The products and services included in this review were received for free from GoScope as coordinated by Deep Creek Public Relations in consideration for review publication. Xploritall is in no way obligated to review said products and services, or to portray the product in a positive light as a result. The opinions expressed in this review are not representative of Xploritall.